Huffman Engineering makes it a priority to continually give back to the community and provided opportunities to youth. The giving back continues with several employees having coached different kid’s sports, volunteering on Booster boards, church activities, mobile pantries, and many more events. Giving back is something that Huffman Engineering will continue to make priority of each year. Each year Huffman Engineering is dedicated to volunteering for Lincoln City Impact and their annual Gifts of Love store, an event that allows low-income individuals to buy Christmas gifts for their children at a reduced rate. Children and students can also purchase gifts for adult loved ones by using vouchers earned through participating in City Impact programs. Each Huffman Engineering employee is encouraged to provide 2 hours or more of service. 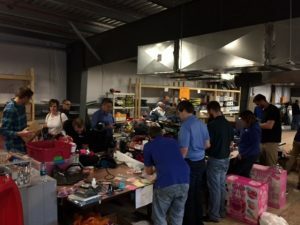 Huffman Engineering has teams out collecting gift items at different locations, packing gifts, unloading trucks, folding T-shirts, sorting through gifts, and inventorying items that are to go to the City Impact store. 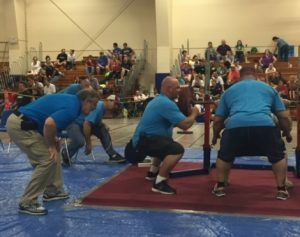 Each year, Huffman Engineering, is a proud sponsor of the Cornhusker State Games Powerlifting Event. Howard Huffman has been the Director of the Powerlifting for many years. Along with volunteers from Huffman Engineering and the community take part to help put together the event. Mr. Huffman oversees activities during the day and makes sure that the entire event runs smoothly. Even during the busiest moments, Mr. Huffman takes the time to help lifters prepare, and offer tips during competitions. Huffman Engineering Inc. also supports this event with a monetary contribution. Huffman Engineering has sponsored the HuskerBots FIRST LEGO League team for several years. Keith Mandachit, Senior Engineer at Huffman Engineering, is very passionate about getting involved in the community and presented the opportunity for Huffman Engineering Inc. to be involved in FLL. Mandachit has continuously supported the FLL of Nebraska. FLL youth participants are faced with researching real-world problems and are challenged to develop a solution by designing building and programming a robot capable of competing. Youth are given the ability to use their science, technology, engineering, and mathematical knowledge but also their imagination and team skills to complete the project. Teams competed in at least three 2.5-minute matches to achieve their highest score. Each year, FLL teams embark on an adventurous Challenge based on current, real-world issues. For example, in 2015, the challenge was to make less trash and/or improve the way people handle the trash they make. Mandachit was awarded the Outstanding Volunteer Award at the Championship tournament in 2012 along with presented a plaque for outstanding coach/mentor. There are several other Huffman Engineering Inc. employees who have participated in coaching and supporting FLL. By designing Challenges around science and technology, participants are exposed to potential career paths within a chosen Challenge topic, in addition to solidifying STEM (Science, Technology, Engineering, and Math) principles that naturally come from participating in the program. Team members also learn valuable life and employment skills which will benefit them no matter which career path they choose. The First Tech Challenge is also through the FIRST LEGO League. 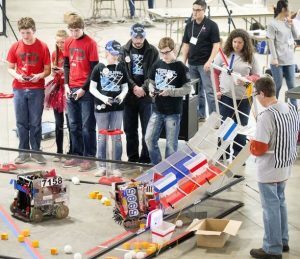 This event is held for older youth with the teams still being responsible for designing, building, and programming robots to compete head to head against other teams. Huffman Engineering Inc. has also supported one of these teams. Huffman Engineering Inc. partners with Cornhusker Bank who puts on an annual event One Day Without Shoes to shed light on the need for shoes in the community and supports the People’s City Mission. Each year over 150 donation barrels are spread throughout Lincoln at partnering businesses for people to drop off donated shoes or donations. Huffman Engineering is a proud supporter of One Day Without Shoes, and has a donation barrel and encourages employees and community members to take part in recognizing the needs of those in the community with inadequate footwear. Several Huffman Engineering employees donate and volunteer for food banks throughout the community including Jeff Austin, who was just recently elected to the Food Bank for the Heartland’s Board of Directors and serves on their Operations Committee. Huffman Engineering also donates to the Lincoln Food Bank, and many other employees donate time and food as well. Huffman Employee, Jay Steinman, has been a part of the University of Nebraska College of Engineering Formula SAE program. In 2012 the Formula SAE competition was moved to Lincoln Nebraska, and Steinman has volunteers each year. He was a part of the first UNL Formula SAE team with the goal of creating real world situations that a team of engineers worked together to complete and compete with other schools. The picture to the right is the UNL Formula SAE car and team with Steinman positioned in the bottom left-hand corner. In 2016 Steinman served as an advisor for the team.